Last month, I spoke of going with another Prayer Leader, to a Prayer Room called The Shack, near Enfield. Whilst there we got a ‘picture’ of spiders silk, first as a single thread, weak and subject to the breakage and the blowing of the wind, but then as a web, holding firm and strong. 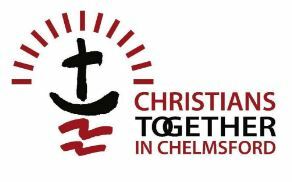 I felt strongly that it signified unity within the churches in Chelmsford; that together, like a web in a garden on a damp morning holds droplets of dew, together we will hold and then distribute to our communities the ‘rain’ of the Spirit. A few days later, on Friday 4 March, we had our second Prayer Space at St. Mary’s, Great Baddow. 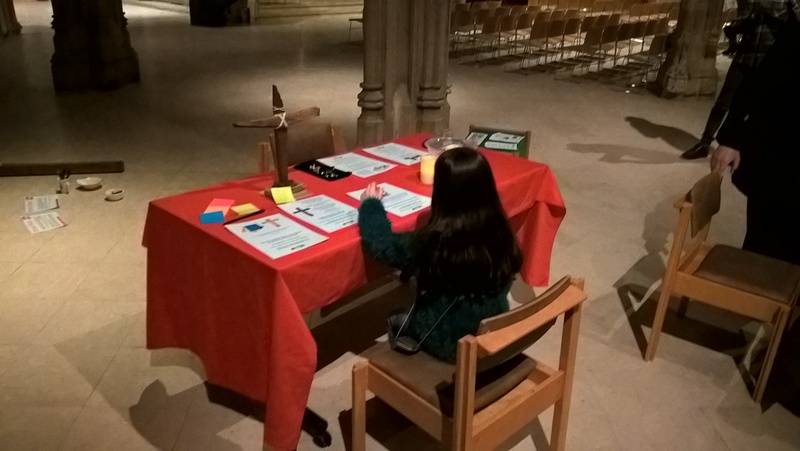 We were all set up and I was at the back of the church just chatting, when I suddenly felt an inclination to go to the chancel, where the prayer stations were set up, and to draw a picture. 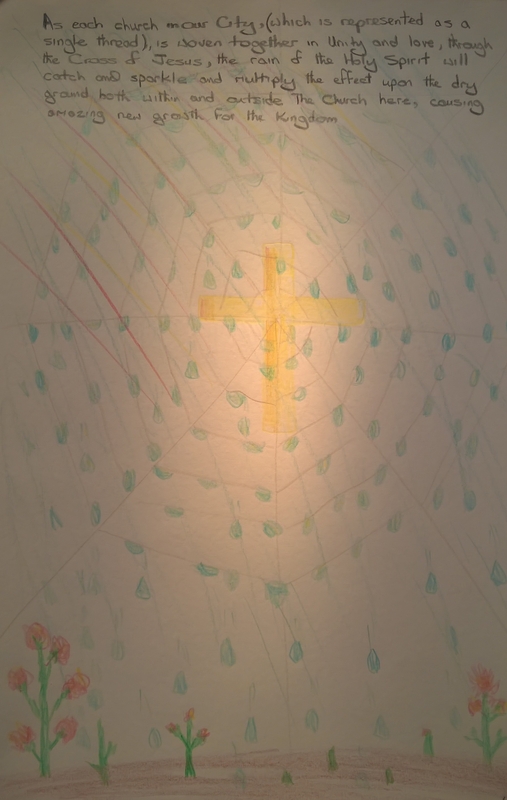 I sat down and drew a depiction of the spiders web and for good measure, drew a yellow cross at the centre, to represent the light of Gospel. 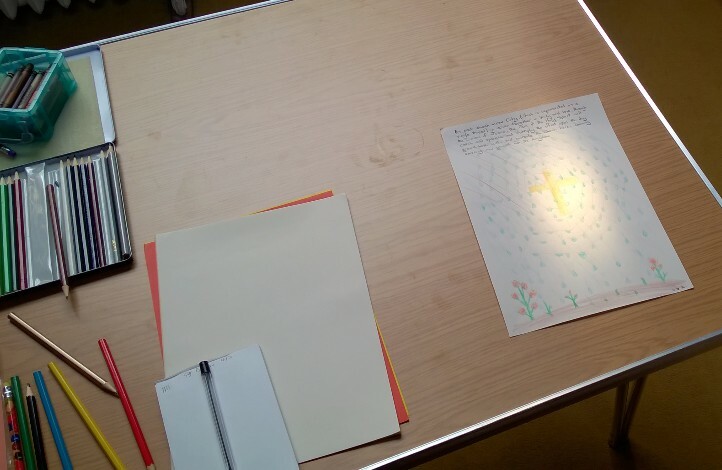 Having finished, I stood back, and with the the piece of paper in the exact same place where I had been drawing, was amazed to see a bright light shining right on the centre of the page and directly upon the cross. There was no reflected light anywhere else on the table or nearby. After some investigation, I found that it was sun-light, which was coming through a high up window behind and which was being reflected back from about eight feet away from a three by one and a half inch brass door plaque on the Vestry door. 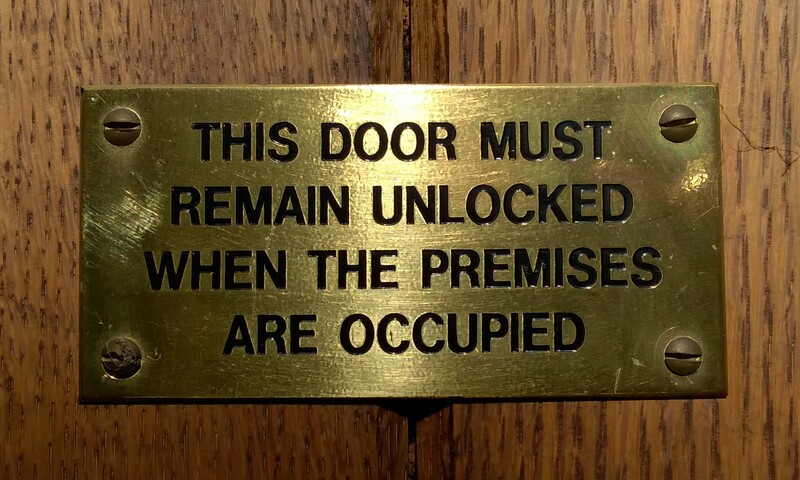 The words on the plaque instructed that the door must be unlocked whilst the premises was occupied. This in itself was amazing, as the very week before, in the Chelmsford 24-7 Prayer Support Team meeting, the theme of the prayers had been opening doors (specifically having church doors open was mentioned) and using our authority to unlock situations in our City using the ‘Keys of the Kingdom’ (Matthew 16:19). 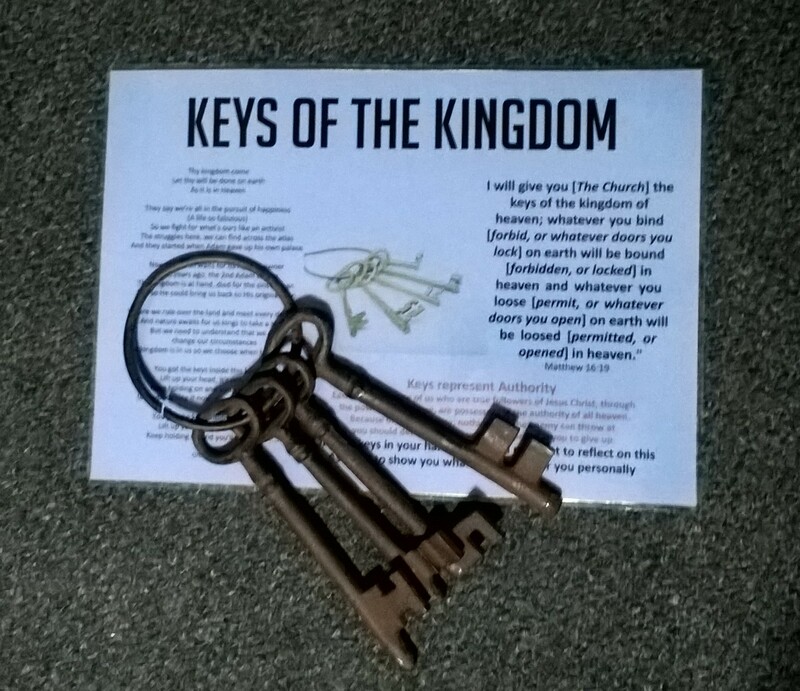 What was also mind-blowing was that only the very day before the Prayer Space, I had purchased a bunch of large ornamental keys to illustrate that fact! I had been thinking of getting some for ages, and just ‘happened’ to see them in a shop I was browsing in! I believe it is also significant that had I started or finished the picture at any other time, even a few minutes earlier or later, the reflected sun-light would have been in a different place. Only a few minutes later, I saw it had ‘moved’ off of the paper to the right, as the earth rotated. So what was God saying? Apart from any personal aspect to this, overall I believe it was a great big confirmation of all that God has previously said about how essential unity between our churches is. This is crucial for His plan of renewal and revival in our City to succeed. Also, that the Gospel of Jesus Christ must be absolutely central to everything we do. It also seemed to be a clear confirmation that we must keep praying, using prayer as the key that will unlock every door that stands in the way of seeing God move in power over our City. And finally, there was I believe confirmation of God’s perfect timing in all of this. If we play our part, He will not be early and not be late. It will come to pass. We live in very exciting times.